When I was about 11 years old my mother started to give me 'kleed geld', a monthly amount of money to buy my own clothes. To teach me some responsibility and to learn how to handle money I guess. Well, you can understand that the first year, all I bought were hair clips, inflatable handbags(it was 1999 guys! ), and a pair of platform sandals in the middle of winter that were also two sizes too big. Eventually I did learn to buy the necessities and that hair clips don't really build a wardrobe. But one thing I haven't bought in the last 13 years is a proper winter coat. Until last Saturday; I feel so old grown up. Choosing a coat is hard; it has to be bought before the real cold starts, which is a time when it's easy to underestimate the winter temperatures, besides it has to be worn every day and fit your every mood. I always ended up layering thick fisherman's sweaters with short leather jackets and long thin coats (yes in that order). But this year I started my research early, but ended up falling in love with a long light powder pink one from COS. Now my new biggest worry is keeping it clean. What a great lesson your mother was trying to teach you, I guess it worked! Im not sure if its Melbourne winter weather or my weakness for well structured clothing but I have quite a collection of winter coats.... all in black, but your white one looks amazing.... next year. its crazy how your really build a proper closet, as you build a house or a room, it's really interesting. Thanks for sharing. this coat is so beautiful...I'm in love with the Cos egg coat too. Great choice also for the color ;)! Amazing look ! Your style is so unique ! Love your post story. I was buying my own clothes at 12 :)...Your coat is amazing and so are your pictures! Love this minimal aesthetic! Wat een mooie foto's! En je hakken blijven geweldig! I am pretty much the same - despite living in a city that one could invariably wear a coat 70% of the year (Melbourne, Australia) as it is unpredictably cold/chilly/raining most of the time... I have never really bought myself a good quality winter coat before. This year, like you - I am planning ahead. I found my dream coat at the start of our summer, and have it put aside so I can purchase it in February (it's quite expensive *cry*) BUT it will be a great investment! Love your powder pink choice. When it comes to coats it really is the final statement of your outfit. It needs to say the right thing. 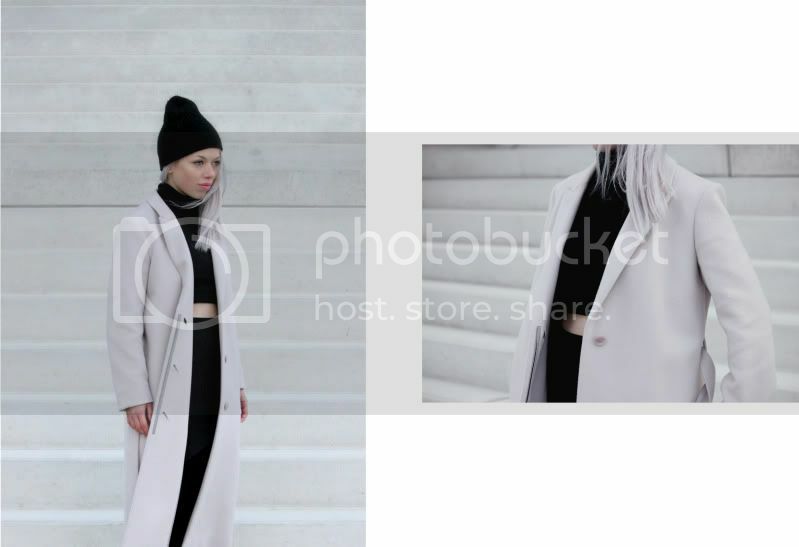 bare midriff works perfectly with a long coat! I love how this is the palest shade of pink. and it's a perfectly versatile shade, so it'll definitely be a piece that will last as trends change! beautiful. This is ridiculously perfect Ivania! You're such an inspiration. I love the look of all black under powder pink! I've been thinking about getting a pale coat since the cold moved in, and I think you've just sealed the deal! Cos is actually next on my list! All the same for me, I even spent a whole Berlin winter, that could be described as 'icy' just with a perfecto. But this year i'm also going to do the things right and I ordered a huge coat from etsy that looks like a shelter against the cold. Yours is perfect, the length and the color are not an easy pick but it looks great on you! SUPER COOL PICTURES AND SUPER COOL COAT! now I'm a big fan of you!!!! How perfect are the COS's coats... I agree with you about the difficulty of finding the perfect coat! Erg goede keus! I just love the 90's feeling I get from this outfit! With a great coat, you can wear pjs underneath and no one will care! Love the shape! OF COURSE, you look stunning, but what really strikes me in this post is the photography. your boyfriend has really perfected the craft. beautiful. and that’s a great lesson your mother thought you. it has obviously worked. My mother did the same thing, and I had never really connected my ability to budget with that. Until now. love your simple but very exclusive style! it was almost the same in my case, but the difference is that I received money very rarely so I had to think twice what to buy to use it for a long time. And I love your coat. That coat is so lovely! I had a grown up moment this week too - I bought my first pair of brown footwear. Prachtige jas! En hij staat je ook heel erg mooi! Kan nog steeds niet begrijpen hoe je altijd zulke speciale outfits maakt, met zulke simpele items! Je hebt echt een fantastische eigen stijl, koester dat! Oh, en die schoenen, die zijn echt fantastisch. Staat heel mooi bij je haar die jas! You definitely chose well! It's a beautiful coat. I'd love a white or light coloured coat for winter but I'm too afraid of marking it. White, mininmal,a bit of oversized....it seems to be the perfect winter coat!! Great choice!! You look amazing! Like how looks this shoes with the tight! fantastic coat. I love COS. Beautiful photos too! Well mothers always have a great technique to teach us things. The coat is great, I hope we men had more options on coats. I really like your style and how it transformed from summer to this winter look! I know that I cold never pull it off. Amazing choice, it so you and I love it. Such a cute story! And excellent choice with the coat, I hope winter treats you well! zo herkenbaar en mooi om te lezen! I really like these shoes! The're perfect for your style. oversized is the best best thing on cold days! Ik kan trouwens niet wachten op je Stockholm post. Ben er twee jaar geleden geweest, helemaal mijn plek! Love how you have created a striking edgy outfit! Love the midi top with the long soft grey coat! How amazing you look. The coat and the shoes are fabulous. I don´t know how you´ll keep the coat clean though. Wish you good luck!!! cool outfit. the color combination is awesome. white & black specially black cap & white hair looks cool. shoes are stylish & increase the glammer. overcoat is simple but looks dashing. Woooow great outfit so beautiful! Same story here this year, with the difference that my coat is by Mango! but it's worth it, such a beautiful coat! Long and simple coats always remind me of the classic vision of a woman entering a late night diner. In any case, the soft pink of the coat contrasted with the black (and being so close in shade to your hair), it's near perfect. This is really an amazing outfit.especially i love the color of your coat.it looks so simple and good for a casual wear.thank you for the post. That heels are amazing. It was one of my birthday's gifts, but it wasn't the good size for me. And now they're out of stock. That's a tragedy ! Those heels are to DIE for!! coat,shoe and outfit is wonderful. White coat my favourite. i love your shoes too. You are looking beautiful. This is my favorite coat.Your coat and shoes both are awesome. You have a great sense of style. I love your post! thanks for sharing! Follow our trades today & gain up to 270% daily.